Mergers & Acquisitions plummeted in the aftermath of the 2008 economic crisis; investor sentiment, consumer demand and most importantly financing was simply not there for deals to happen. However, as US corporate profits reached sixty year highs and global economies are growing, M&As are coming back with a bang. Investors regain their risk appetite; strategic investors feel the pressure to use their newfound riches to invest in future growth, either through acquiring technology or market share. Financial investors start flexing their muscles as new capital starts flowing in their funds. Earlier this year BC Partners raised 4 billion Euros ($5.6 billion) for a new fund, Apax is expected to raise around 11 billion Euros by the end of the year (Source: Reuters). Although the recent rebound however, global M&As are down 35% compared to the 2007-2008 highs, reaching $2.4 trillion in total value in 2010, according to Mergermarket data. M&A recovery is mainly fuelled by a rebound in the US and Europe, the largest markets, and continued growth in emerging economies. Almost 60% of the activity took place in Europe and US; of that, middle market deals where $356 billion or around 25% according to Mergermarket data. According to Thompson Financial and Deloitte US Corporate Finance total middle market deals in the US only was $175 billion in 2010. A total of 7,100 transactions were completed with average size of around $80 million. We have no available data for middle market deals in emerging markets but should be high considering the companies’ size there. 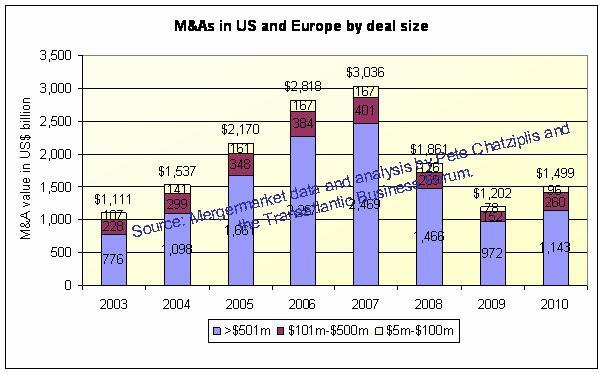 The following graph illustrates M&As by deal size in Europe and US over the last 7 years, which pretty much spans the latest economic cycle. Deal activity spiked in 2006-2007 fuelled by LBOs. As these are large deals, M&A activity was more prevalent in large cap companies although middle market deals increased as well. Another differentiating factor attached to LBOs and large deals is the high participation of financial buyers; in middle market on the other hand private equity participation is relatively lower, at 13% of all deals (Thompson data). As economies start to recover there are definitely better days ahead for M&As and especially for the middle market that forms the backbone of most economies. According to CIT and 2010 US Census data, there are 106,000 middle size companies in the US employing 32 million people. Their total annual revenues of $6 trillion compare to $8.3 trillion of the S&P 500 companies. Their total capitalization is estimated at 60% of total U.S. equity market capitalization. Mid size companies are increasingly expanding globally, tapping into opportunities overseas be it in production resources or demand for their products. According to Mergermarket, cross-border transactions accounted for 31% of all deals in the first half of 2010. In a 2007 survey performed by KPMG’s Global Enterprise Institute four out of ten middle size Colorado companies considered global expansion as integral to their growth strategy and the majority of them actively focused on expansion plans. This post aims to illustrate the significance and global potential of the middle market M&A sector that often doesn’t attract that much of media coverage. It will also aim to touch upon some best practices to bring cross-border middle market deals to fruition. Before moving any further let’s make sure we are on the same page regarding definitions. So what really constitutes middle market? By industry convention, at least in the US, middle market refers to those companies with revenues between mostly $10- 500m and as high as $1 billion at the upper end of the range. The market is divided into lower, middle and upper brackets, with different characteristics in terms of management style and organizational resources; by that we are referring to Robert Slee’s work on private capital markets and more specifically the Slee, Trottier paper on middle market segmentation. Mid market’s lower and middle bracket deals fetch between $10m to $500m as a broad guideline. Price considerations off course depend on case specifics and industry sector, i.e. small companies in basic industries might fetch lower prices than fast growing new economy companies where even low earning figures can produce disproportionately high valuations. What’s important to note however is that the middle market definition should not be considered unambiguous around the world. Depending on local circumstances such as level of development and industry segmentation the middle market ranges can vary. Looking for example at the graph below the percentage of companies with less than 10 employees is much higher in OECD’s less developed economies pushing higher the middle market mark there compared to US; UK, Germany and other economies in later stages of development. To our opinion what’s middle market depends on the “big-fish–little-pond” effect: the size of your pond is what really defines where you stand. What’s considered small or middle market in the US might be taken for big somewhere else, just as a large-size US shirt might be extra large somewhere else. What’s the implication of this? There’s a huge difference in terms of self-perception. Hung out with basketball players and you might feel mid size, lead the boy scouts and you might feel a giant. These differences in self-perception make a huge difference in psychology that warrants special attention when approaching a deal. For example, a midsize company by US standards might be a regional champion in some other country, employing a large number of employees and generating significant wealth for the particular economy. The differences go beyond semantics; they are about management styles and importance in the local setting which all bear implications during the M&A negotiation phase and beyond. Place executives from these two different worlds on the same table and you realize that they don’t only speak different languages in terms of mother tongue or cultural background but also in terms of personal objectives, styles and aspirations. Failure to appreciate that early enough in an M&A process can lead to results that range from amusing to catastrophic. As mentioned above mid market M&As are expected to recover and along with the global economy increasingly become cross-border. According to Mergermarket data, the total value of cross-border transactions rose by 60% in the first half of 2010 reaching 31% of global deal value. Total US outwards middle market deals reached $32.9 billion in 2010 of which 35% landed in Europe (Thompson Financial and Deloitte US Corporate Finance). Add to that the large deals and you end up with total transatlantic deals of $160 billion just to underline the size of the market opportunity that the Transatlantic Business Forum and our blog follow. 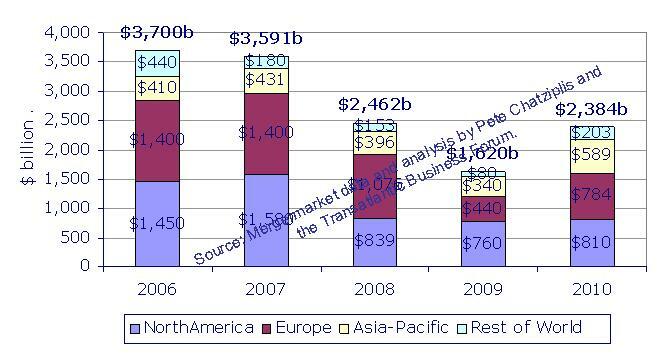 Outside Europe, large increase in middle market outward M&A took place in Canada, Japan and India. Alongside the interest from western world to the emerging markets, the Mergermarket data shows that increasingly emerging market companies are also becoming extrovert. Outbound deal activity from the emerging markets rose 318% by value and 111% by deal count in the first half of 2010. According to the U.S. Census Bureau, U.S. companies with a value of $260 billion were acquired or established by non-U.S. owners in 2008 up fourfold from 2003 levels; it is expected that his trend will persist (Source: The Deal: The middle market goes global). There are various reasons for the increase of cross-border transactions. Below we attempt to highlight some of them without aiming to make this list all-inclusive. •	Stage of development: there’s increasing integration across global economies; there’s no denial to that. Globalization allows developed world companies to take advantage of growth prospects in emerging markets as well the later of consumer strength in the former. These opportunities arise from lower but rising GDP per capital levels and lower labor costs in the emerging world (see graph below taken from our recent post about stimulating investment in Europe’s periphery). The latter is a driver for outsourcing, however we would argue that this only cannot be a long term investment criteria as the cost advantage will most probably be sustainable over a specific period. For example there are concerns that although China’s immense production capability, costs there start to grow too. •	Modernization: Developing economies are in the process of modernization; they often start from low value added processes and hopefully move towards higher value added products and higher GDP levels. In this context the large number of promising middle size companies need to retool, upgrade processes to remain competitive as trade barriers fall or labor costs increase. That is crucial in order to preserve their role within local communities. In this context they may welcome foreign input. •	Horizontal expansion: M&As for middle size companies provide a way to grow quickly and break into the large company bracket thus enjoying economies of scale in production, marketing or finance. This growth can be achieved faster and with less risk when existing strengths and products can be leveraged across different regions. Off course this assumes that existing products and know-how can be easily adjusted to foreign environments. In comparison, further penetrating their local niches or even moving into new ones might be too challenging. •	Restructuring/bottom fishing. According to the Transatlantic Restructuring Outlook report published by Debtwire in association with Merrill DataSite it is expected that activity in this area will increase in 2011. Restructuring drivers for North America will be corporate sector distress while in Southern Europe solvency concerns resulting from the sovereign debt crises especially in financial services. 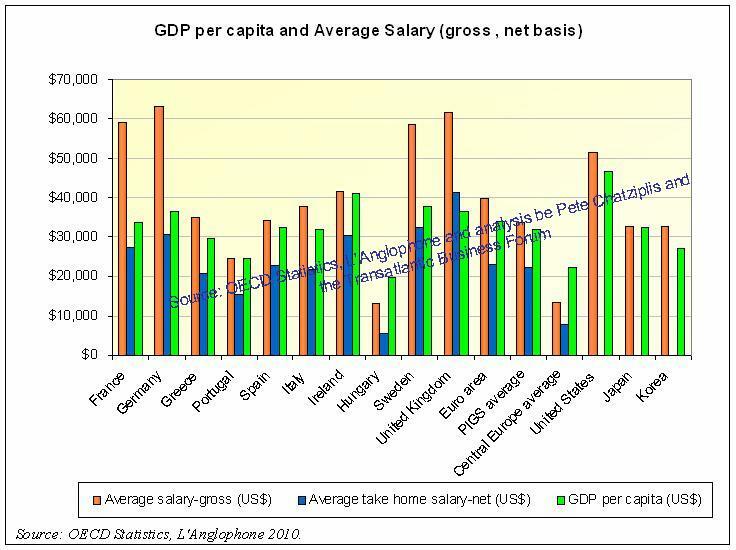 Financial distress in Europe’s periphery is a highly publicized problem these days. Additionally Central and Eastern Europe will continue to promote inward investment and modernization. There, as well as in Southern Europe the highest percentage of suitors will be strategic buyers as they could quickly gain market share through a distress sale. But then again, private equity activity has relatively slowed down in Europe. •	Unavailability of capital or of investment options. Companies in developing economies, especially the middle market ones, are usually plagued by difficulty in accessing capital to finance their growth. On the other hand there’s significant accumulated capital and financial know-how in developed countries with limited investment options locally. We believe that this creates significant inefficiencies in capital allocation. Probably for this reason large US banks are looking into assisting middle market companies in their overseas quests leveraging strong capital base and global network (Source: article). On the other side an acquisition in a developed country can provide an emerging economy company access to capital and sophisticated financial products be it through stock market, private equity or bank loans. In this context some companies have pursued reverse mergers to list in the US. •	Access to capital and know-how: According to a UNDP’s report (“Unleashing Entrepreneurship: Making Business Work For The Poor”, UNDP 2004) private sector in emerging economies face certain limitation as it has to operate in corrupted and bureaucratic environments with ill-directed macroeconomic policies and poor infrastructures. According to the report: “even with strong macroeconomic and institutional foundations, three additional factors are indispensable for entrepreneurship and the private sector to flourish in an economy: a level playing field, access to finance, and knowledge and skills”. Entering a developed economy can provide much needed access to advanced technology and know-how. •	Access to natural resources: there’s increasing competition for commodities in a growing global economies. Access to commodities is critical for sustainable growth so we are observing increased interest for investment in natural resources in Africa and elsewhere. •	FX/capital gains: as the US is following a weak dollar policy (low interest rates alleviate the housing market crisis) while emerging economies’ currencies and consumer demand are growing (for example in Brazil, China) there’s a benefit for US companies expanding and investing overseas. We would be critical of investing driven by capital or FX gains only; as this could be speculative and not related to core business. On the other hand there are certainly business owners that may consider building wealth through capital gains (related articles on demand for US manufacturers and capital flows to emerging markets). •	Prestige: operating in a developed economy or in an emerging economy can also enhance some companies’ image. We had to resist the temptation of excluding this reason as it might seem a bit superficial but we think that it is at least in the back of some buyers mind. For example a company can be considered as having growth potential when expanding its global reach and entering an emerging economy while a developing world company can be perceived as playing on another league when operating in a developed country. Succeeding in executing an M&A doesn’t come easy. The right target should be selected, the one that fits in terms of competencies and management culture, the right price and financing should be negotiated and finally the company can be integrated in a way that resources and time is not wasted. This is not easy; actually a large number of M&As do fail. For a middle market company to succeed in a cross-border transaction or even in a simple cooperation it should select competent advisors and invest on training its management team to deal with issues related to strategic management and international finance in order to fine tune use of capital and maximize shareholder value. Management should also become aware of foreign economies and cultures and walk in negotiations without prejudices or assumptions based on own experiences. M&A advisors should master a large array of topics in finance, legal, tax and operational matters. This is highly specialized knowledge; therefore a team is necessary with discreet roles. As this is not already enough cross-border M&A advisors should be knowledgeable in both regions to be able to bridge differences in economic circumstances, regulations and cultures. Throw in special regulations associated with foreign investment such as FCPA (Foreign Corrupt Practices Act) and the typical middle market company has enough red tape on its plate to be overwhelmed. Middle market companies that lack the human capital resources of their larger competitors require increased support during M&As. Apart from that however, planning and executing an M&A can turn out to be a very useful self-evaluation exercise. Working on M&As external advisors bring in valuable technical background and experience from other sectors and transactions playing thus a valuable cross-insemination role. By examining acquisition options companies can evaluate their own competencies and strategy. By valuing acquisition targets they can gain insights on their own cost of capital and value creation record. Thus an M&A can have multiple benefits in shaping up a company in its quest to grow and become more competitive. The problem with middle market companies is that they don’t reach out to external consultants that often. Cost can be a reason as smaller companies are usually tight with their money, disbelief can be another. On the other hand there’s a limited supply of knowledgeable consultants for middle size companies. Advisors in this market should possess knowledge that is directly applicable to companies of this segment and ability to engage and communicate it. Problem is that much of business literature is created by business schools or consultancies with largely, blue chip companies in mind. Capabilities, objectives and resources of large listed companies usually vary considerably for those of middle market private companies. On the other hand middle sized companies may be underserved by consultants with limited technical background largely depending on empirical knowledge. The ideal solution can be somewhere in the middle where advisors have the right education but also experience in dealing with middle market companies so that they are able to select and apply the most suitable tools for the case in hand. On the cost side there’s little that can be done for investing on quality. A problem with middle market deals, especially those on the lower range, is that their small size often makes it uneconomical for advisors to work on them on a contingent basis. Work required for large or middle size deals doesn’t vary that much in terms of effort and time; however commission based compensation does. We believe that a solution to that can be provided by technological breakthroughs that make certain processes more efficient. For example advisors increasingly are able to source buyers or targets through online M&A platforms such as MergerID, AxialMarket or others. These platforms can provide liquidity and transparency to private markets, saving the effort in market screening and follow up that bites into transaction fees. We, in the Transatlantic Business Forum are great supporters of the online liquidity platforms (private company exchanges) and follow developments on a continuous basis (if interested further you can read our recent post about main competitors here as well as our presentation on the market ). For all the above reasons we are very optimistic of middle market prospects both at national level but increasingly cross-border as well. However success is very much depended on getting the right advice. The Transatlantic Business Forum is a portal, online community of professionals and consulting firm that aims to facilitate discussions on international business and especially between Europe and the Americas and promote and facilitate opportunities for cross border capital flows be it Mergers & Acquisitions, Partnerships or Trade. Contact at: info@transatlanticbusinessforum.com. This entry was posted in M&A Markets. Bookmark the permalink. I read your Middle Market research article with great interest. I agree with your Middle Market Growth presentation. I found it very informative, referenced, researched, presented and well thought out. Economics and Finance are similar to the gravitational pull of the Moon on the Earth and its oceans influencing the natural tidal ebbs and flows of trade and commerce. As domestic markets slow down, to survive and maintain their capital base, Middle Market Firms need to “look over the horizon,” beyond our shores and quickly research and seek out new potential markets overseas. Conduct regional international market research and set their marketing, new business development strategic sights across international borders, Trans Oceanic for new developing business opportunities, that they feel that they can bring unique value, goods and services to in order to capture a percentage of that market place, to cover both their expansion expenses, off-shore operating costs while still generating a reasonable profit, to be repatriated home. The Middle Market R&D is a constant never-ending daily research process, designed to stay constantly attuned, current to International Market trends and their inherent International Regional Market Risks in addition to seeking out unique business, service opportunities that offer obtainable profit margins. In an age where US companies are loath to invest in their internal professional staff’s continuing professional education and specialization, this is exactly where Middle Market Firms need to make their first major International Expansion Investments in anticipation of Over Seas International Expansion. •	Are pre-acclimated to various International Geographic Regions. •	Speak, read, and write research in multiple languages, fluently. •	Are sensitive to diverse cultures, mores, religions, ethics, or the lack there of, ethos. •	Are interested in long term, in depth emersion of expatriate overseas assignments, so that they become fully integrated with the national and regional cultures of the host nations. •	This program is specifically designed, customized on a case-by-case basis based on current Risk Assessments, by International Regional Assignment, for the actual executives, SME’s, their spouses, children, immediate family members and support staff members.